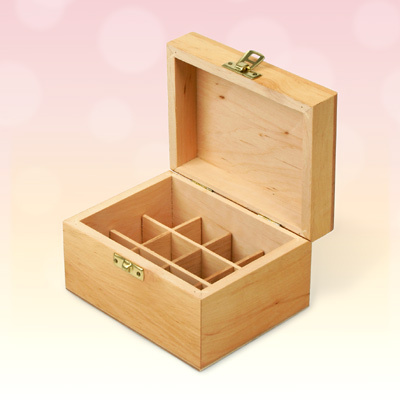 This neat and compact aromatherapy box is crafted from Alder wood sealed with a satin laquer finish that lets the natural woodgrain pattern shine through. A brass closure clasp keeps the lid firmly on and your bottles of essential oil safe. Atractive and lightweight, this aromatherapy box will hold 5ml or 10ml essential oil bottles measuring up to 28mm in diameter. Each essential oil bottle sits within its own divided space which helps to keep them safe during transit.